In the days leading up to and immediately following the Kentucky Derby, all I heard about was Orb. Orb, Orb, Orb… I finally understood how Jan Brady felt. Frankly, I wasn’t that impressed with the horse and had trouble understanding what all the fuss was about — kind of like Nicki Minaj’s career. Even after he made me look foolish in Louisville, I still wasn’t convinced that Orb had what it took to be the subject of a future Disney movie, much less a Triple Crown winner. Of course, I made this determination based on numbers: speed ratings and my own pace figures (speed rations) — and that’s where the trouble started. You see, I found out from racing fans and other media types that the data I’ve relied on to guide me through the perilous pari-mutuel waters for more than 20 years were, well, worthless. Beyer was (and presumably still is) an idiot; Tom Brohamer is a complete moron; Bill Quirin is a certified loon — and I belong in a padded cell for ever listening to and/or learning from these whakos. According to Orb supporters, the colt’s dominance in the Run for the Roses was a matter of will — not pace, not speed. Indeed, legendary turf writer Damyon Runyon was dead wrong when he said, “The race is not always to the swift, nor the battle to the strong, but that's the way to bet.” The way to bet, I was told, is to ignore speed and pace figures like the stuff growing hair in my refrigerator and focus instead on how a horse looks and how it behaves. Only by becoming an expert in body language can one hope to triumph at the windows, I was informed. Then came the Preakness Stakes… and complete and total redemption for figure handicapping. While Orb mania reached a fever pitch throughout cyberspace, I expressed concern about the condition of Shug McGaughey’s stable star on my May15 podcast, speculating that he was likely to regress in the Preakness and voicing concerns about his fair odds. 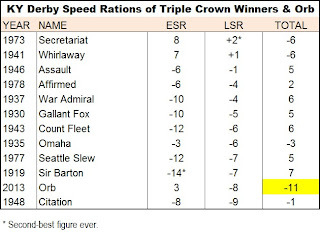 When the race ran true to the numbers (at least my numbers) — Oxbow was the winner, Itsmyluckyday finished second, Mylute rallied for third and Orb straggled home a distant fourth — the “body language” crowd was quick to blame the Derby champ’s defeat on jockey Joel Rosario’s incompetence, the “dead” rail, the pace, George Bush (just a hunch), etc. As for me, I gave silent thanks to Beyer, Quinn and Quirin and collected my superfecta winnings.